In September 2011, we paired with our friends at Style Me Pretty to give away 100 invitations, reply cards and printed envelopes from our Style Me Pretty collection. 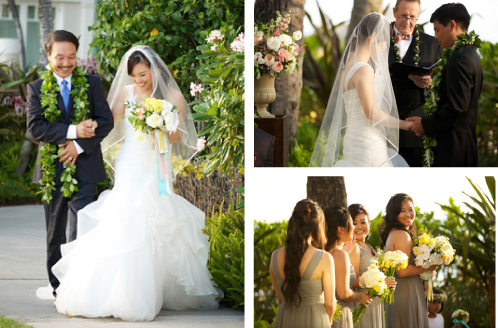 This past September, contest winner Jennifer married Jonathan near the beach in beautiful Hawaii where she grew up. 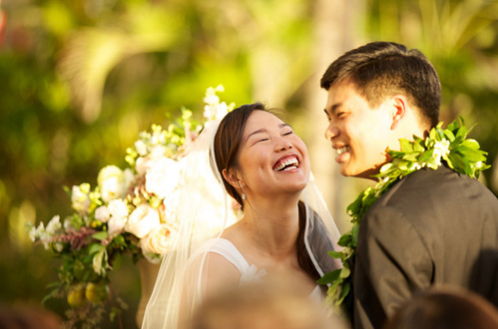 We caught up with her recently to congratulate the happy couple, learn more about the wedding, and find out how they fell in love with their invitation suite. "Our wedding is a pseudo-destination wedding since 80% of our guests, including us, are currently living in California. The pseudo comes in because Hawaii is where I was born and raised. Hence the 20% is my family and friends who still currently reside there. We chose Hawaii because it's Hawaii! It's beautiful, has gorgeous weather, and I just loved the idea of a wedding near the beach. What I loved most was the idea of sharing home with my soon-to-be family and our friends. But in terms of our wedding style I didn't want it to be completely tropical or too destination-y (for lack of a better description). Hawaii isn't a tropical oasis to me; I just wanted to share the Hawaii I loved. Not to mention our style isn't extremely vintage or totally rustic but clean and a bit modern with a touch of vintage love. Honestly, planning our wedding helped us find our style. We fell in love with the first and oldest hotel in Hawaii with its iconic white columns, wide verandas, beachfront location and the Hawaiian touches within the hotel including the art and upholstery. It was so unique and picturesque. Not to mention the beautiful lawn overlooking the beach, where the ceremony was held! I don't know if we necessarily had a theme in mind while making wedding decisions, but when we had to make a decision we went with what we loved and our gut feelings. So when everything came together, our wedding truly reflected us. I should mention I LOVE stationery and looking at all types of wedding stationery was one of the highlights of wedding planning. I saved pictures of invitations and invitation suites I loved, which ended up being a lot. Fortunately, right when I saw this new Style Me Pretty invitation suite I fell in complete love! I'm even luckier that my husband realizes how much I love stationery and, for the most part, he let me handle all stationery details. I couldn't believe that I had found a suite that encompassed everything I wanted! It was elegant, yet modern at the same time, and it had touches that evoked the beach. I marveled at how the beach theme was felt but wasn't obtrusive. 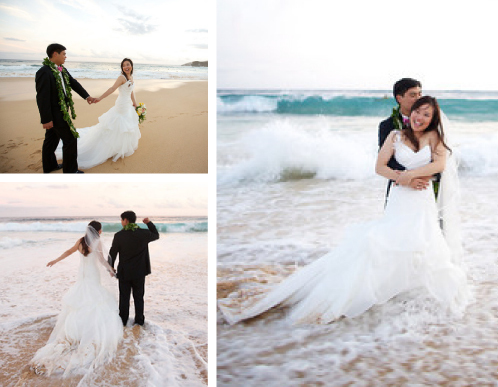 I was tired of seeing the typical ocean-front scene or sea shell motifs on destination wedding invitations. I honestly could not believe how perfect this suite was! Every detail worked together so seamlessly; the clean lines and elegant script spoke to tradition, but the addition of the painted edge and chevron liner added just the right amount of modern design. I still love every detail regarding the suite, but if I had to choose, my favorite would have to be the hand-painted turquoise edge - it is to DIE FOR. I literally cannot stop gushing about how much I truly love everything about the entire suite! And then I won the Style Me Pretty Contest -- I actually won! I couldn’t believe I won our dream invitations. They were the perfect way to set the tone for what turned out to be truly one of the most magical days of our new life together! To personalize our hand-painted turquoise edge invitation suite for your wedding, click here.